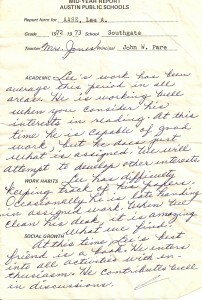 At Christmas, as part of my parents’ gift to me, they included my mid-year report card from 4th grade. This obviously was from an era in which, unlike Garrison Keillor’s Lake Wobegon, not everyone was considered above average (click to view at full size). I still like books, as you can see from our library picture in the SMUG Facebook group. I’m still pretty enthusiastic and contribute well to discussions. It’s still amazing what I find when I clean my desk. So after I head to the Y for a run, I’ll be exploring for treasures in my home office desk. 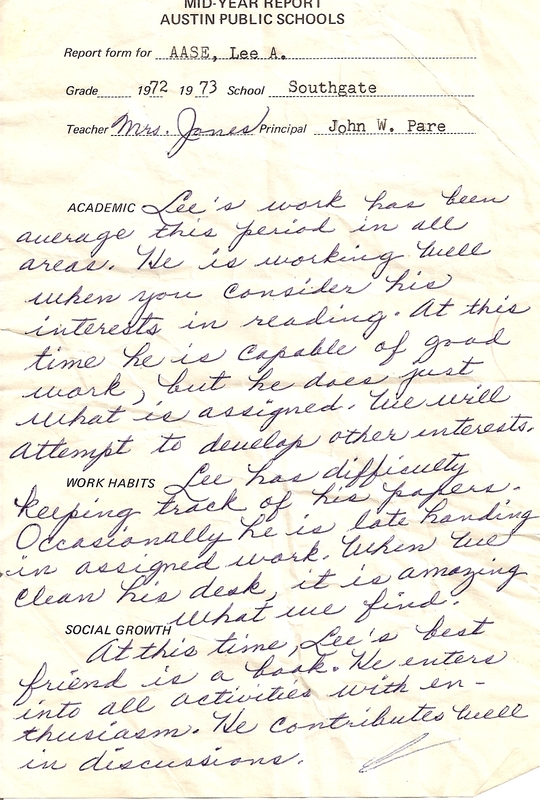 Maybe that runs in the family, though: I think it’s pretty amazing that Mom would find a 37 year-old report card. I’m hoping Mrs. Jones would be proud that one of her “average in all areas” students has grown up to become a university chancellor. I love this! Oh, if only the young Lee had been able to get his hands on a copy of “Getting Things Done”… what would the world look like today? Intelligence is so nebulous. What exactly is your core strength….. Unless you are a mathematician, life is more about everything else. we must all pursue our gifts….